Palazzo Contarini-Mocenigo a S. Beneto, Venice, until the mid 19th century. Princes Giovanelli, Venice, by 1871 until the early 1930s. (Duveen Brothers, Inc., London and New York); purchased 15 December 1936 by The A.W. Mellon Educational and Charitable Trust, Pittsburgh; gift 1937 to NGA. According to Gianjacopo Fontana, Venezia monumentale pittoresca, Venice, 1863[? ]: 258 (Reprint ed., Lino Moretti, Venice, 1967: 278). See also Otto Mündler, "The Travel Diaries of Otto Mündler," ed. Carol Togneri Dowd. Walpole Society 51 (1985): 82, 257; he describes the painting, which he saw in November 1855, as "Fine portrait by Ant. da Messina, which has been barbarously cut and reduced on the sides." Agostino D'Amico, "Antonello da Messina, le sue opere e l'invenzione della pittura ad olio." Archivo Storico Messinese 5, no. 1-2 (1904); 113, reports that, according to a letter from Commendatore Barozzi dated 23 June 1902, the painting came from the Manfrin Collection toward the end of the eighteenth century. The NGA portrait is too large to be identifiable with a "testa" given to Antonello in the Catalogo dei quadri esistenti nella Galleria Manfrin in Venezia, Venice, 1856: no. 62 (27 x 31 cm). But a "testina di giovanetto" attributed to a Flemish artist, no. 5 in the same inventory (37 x 29 cm), if it were subsequently cut down as the NGA painting appears to be, could be a candidate. The original Duveen Brothers invoice is in Gallery Archives, copy in NGA curatorial files. The painting is listed as from the collection of the Palazzo Giovanelli in Venice, and formerly in the Palace of Alvise Mocenigo at San Stae. 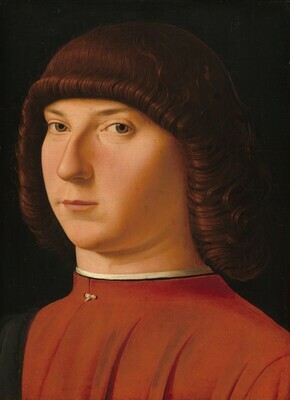 Antonello da Messina, Museo di Arte Moderna e Contemporanea di Trento e Rovereto, Rovereto, 2013-2014, no. 34, repro. Duveen Brothers. Duveen Pictures in Public Collections of America. New York, 1941: no. 70, repro. Preliminary Catalogue of Paintings and Sculpture. National Gallery of Art, Washington, 1941: 7, no. 31. Book of Illustrations. National Gallery of Art, Washington, 1942: 239, repro. 57. Paintings and Sculpture from the Mellon Collection. National Gallery of Art, Washington, 1949 (reprinted 1953 and 1958): 32, repro. Summary Catalogue of European Paintings and Sculpture. National Gallery of Art, Washington, 1965: 9. European Paintings and Sculpture, Illustrations. National Gallery of Art, Washington, 1968: 2, repro. European Paintings: An Illustrated Summary Catalogue. National Gallery of Art, Washington, 1975: 14, repro. Shapley, Fern Rusk. Catalogue of the Italian Paintings. 2 vols. Washington, 1979: I:17-18, II:pl. 11. Walker, John. National Gallery of Art, Washington. Rev. ed. New York, 1984: 118, no. 102, color repro. European Paintings: An Illustrated Catalogue. National Gallery of Art, Washington, 1985: 31, repro. Mündler, Otto. "The Travel Diaries of Otto Mündler." Ed. Carol Togneri Dowd. Walpole Society 51 (1985): 82. 257. Boskovits, Miklós, and David Alan Brown, et al. Italian Paintings of the Fifteenth Century. The Systematic Catalogue of the National Gallery of Art. Washington, D.C., 2003: 42-45, color repro.